Bhatkande Sports Academy organised MLA Sanjay Patil T20 Belgaum champions league will begin with a grand opening ceremony to be held on 21st January at CpEd. Grounds Club Road. All the matches will be played at the same ground and work is on in full swing. Today (18-01-2010) a rally with of all the teams will be organized which will start from Chenamma circle and will culminate at Hutatma chowk. The BCL trophy opening was done early this morning by MLA Sanjay Patil at Gomatesh Vidyapeeth. This is another golden opportunity for the local talent to show their capability and local talent is getting a nice platform to showcase their talent. 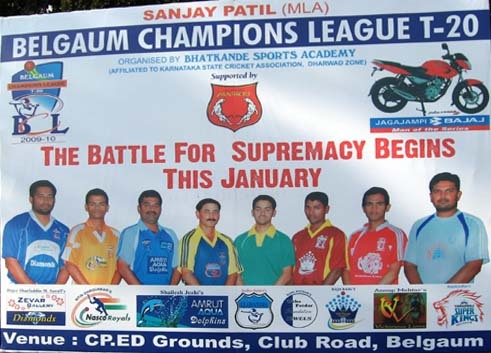 Belgaum Champions League T20 begins from 21 JanuaryMLA Sanjay Patil T20 Belgaum champions league will begin with a grand opening ceremony to be held on 21st January at CpEd. Grounds Club Road. 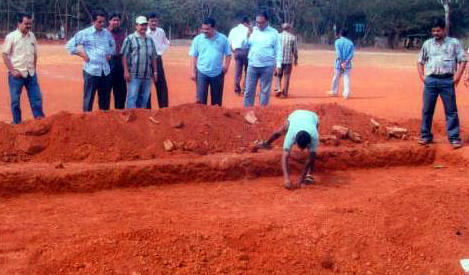 All the matches will be played at the same ground and work is on in full swing. Amrut Aqua DolphinZevar Gallery DiamondVardraj Super Kings Potdar foundation JewelersSri Sai Sports GladiatorsVictorious LionsNasco RoyalsGold Museum CrownThis is another golden opportunity for the local talent to show their capability and local talent is getting a nice platform to showcase their talent. IT WAS THE FANTASTIC TOURNAMENT WIT A GRAND SUCESS …..WE R PROUD TO PLAY …AND FEELS GOOD TO LIFT THE FIRST BCL TROPY WIT OUR PROUD OWNER ANUP MEHTER…THANKS FOR ORGANISING AND IT WILL B DONE IN COMING YEARS….